You may not realize how many email lists you’re subscribed to until the holiday season arrives. If you're like me, you start to feel bombarded, and begin to wonder if and when you subscribed to these newsletters in the first place. Most of them are probably from your favorite retailers, restaurants, airline companies, music stores, and so on. But who says holiday emails should only be limited to retailers? As brand marketers, email is one of the most powerful and effective marketing strategies we recommend for many of our clients across varying industries—especially during the holidays. Even if you’re not in the retail business, your company has something valuable to offer current and prospective customers, whether that's industry advice, special offers, a free e-book, or even just a sincere holiday greeting. Simply put: the holidays present an opportunity to connect with your audience that should not be overlooked, regardless of your industry. To make the most impact with your holiday emails, it’s best to have a high-quality list of subscribers. Rather than focusing on accumulating as many subscribers as possible, it’s more valuable to build a list of subscribers who are most likely to engage with your brand, services and product. Wondering how to compile a high-quality list of subscribers? Take a look at some of our favorite tools and tactics below. Pipedrive is a sales management tool designed to help small teams manage intricate or lengthy sales processes. Your business can utilize Pipedrive by scanning in business cards you've collected and then pushing them with your Zapier account to your email aggregator, such as Mailchimp or Constant Contact, and your CRM. Pop-ups are another great way to grow your subscriber list. While pop-ups generally receive a bad rap, they really do work, especially when it comes to gaining valuable email subscribers. Implementing a pop-up feature prompting first-time visitors to subscribe to your company's newsletter/email list is an unintrusive yet still effective tactic for growing your list of email subscribers. Because the pop-up only appears for first-time visitors, they will not be bothered with it during future visits to your site. Additionally, only those visitors who are truly interested in your company's service, product or special offering for signing up (e.g. coupon, e-book, free download, etc.) will be motivated to sign up from a pop-up, which means only those most likely to actually engage with your brand will be receiving your emails. When it comes to your subscribers, quality over quantity! To show you how pop-up subscription prompts work, let's take a look at our client Control Solutions. 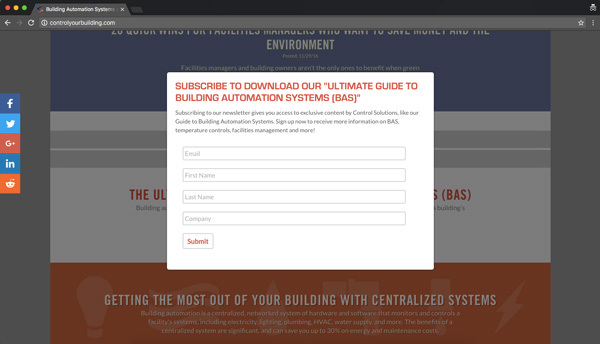 If you're a new visitor on their site, you should see a pop-up prompting you to subscribe to their newsletter in exchange for The Ultimate Guide to Building Automation Systems. This pop-up only appears for first-time visitors and does not require completion to navigate the rest of the site. Upon signup, subscribers are automatically taken to the Ultimate Guide to BAS, and also immediately receive a 'Welcome' email and a downloadable PDF of the guide. As you can see, these are quite substantial results to achieve in such a short timeframe. Mike Hendricks, Business Development/Marketing Manager at Control Solutions, is pleased with the results of the pop-up tactic thus far, as well. "Since The Image Shoppe implemented the pop-up email subscription for visitors to receive our guide, we've seen a significant increase in downloads, and we created a list of prospects from this effort," Mike said. "I highly recommend this tactic as a way to increase the number of high-quality subscribers and as a lead-generation source." Whether your holiday email offers a special promotion or solely serves as well-wishes for the holiday season, make sure to send something out this month. Need some more convincing? Check out this article from Inc., explaining why email marketing is more effective during the holiday season.